I’m Dr Alice Greene and I run The Fourth Floor Practice in Harley Street, London. I use homeopathy and complementary therapies to help with health issues and general wellbeing. I began my career in healthcare as a GP, but I felt that simply prescribing drugs wasn’t enough to help my patients heal. So I built on my medical experience with training in complementary therapies such as psychotherapy, autogenic training and homeopathy. Now, I use a holistic and non-drug approach to healing and wellness. My experience in homeopathy and complementary therapies is extensive. I’m a founder member of the Homeopathic Professionals Teaching Group (HPTG), a Fellow of the British Autogenic Society and a member of the United Kingdom Council for Psychotherapy (UKCP). Holistic medicine stimulates the healing potential inside you. It goes deep to nurture and heal all aspects of who you are – physically, emotionally, psychologically and spiritually. I offer an eight-week training system of deep relaxation and stress management that will give you tools to use for life. Through therapy, I provide a safe and confidential opportunity for self-reflection, which allows you to explore anything that may be worrying you. I use remedies derived from natural sources in order to stimulate your body’s natural healing processes. "I am able to really relax and enjoy life. I’ve achieved a kindness towards myself. I have learnt to take things in my stride, a day at a time and not to worry too much about the future." I founded The Fourth Floor Practice in 1989 and have been the medical director ever since. I work with practitioners who work in other disciplines, such as osteopathy, rehabilitative pilates and craniosacral therapy, in order to offer you a wide choice of complementary therapies and psychotherapeutic approaches. 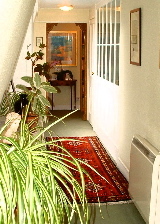 It is our goal to welcome you in and find the right holistic approach to help you feel well again. Please contact me to book an appointment or talk about homeopathy or complementary therapies in west London. The Fourth Floor Practice is at 86 Harley Street, London W1G 7HP. You'll find us halfway down Harley Street, near the intersection with Weymouth Street. Please press "Patients" on the video entryphone at the right-hand side of the door and the receptionist on duty will guide you to the lift (or four flights of stairs!) to the Fourth Floor waiting room.